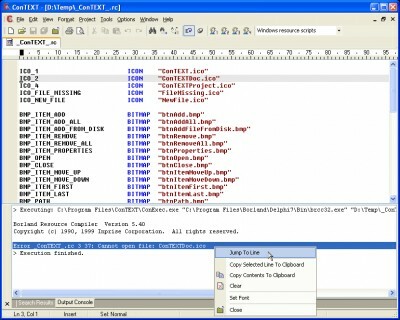 ConTEXT is a small, fast and powerful text editor, developed mainly to serve as secondary tool for software developers. After years and years searching for suitable Windows text editor, I haven't found any of them to completely satisfy my needs, so I wrote my own. This editor is freeware. Anyway, I'd like to hear your comments and suggestions, to discuss about it and implement it in future versions. Synnote is developed as a 32-bit syntax-coloring text editor for win9x/NT. EditPro is an award-winning text editor for programmers and webmasters. AEdiX Suite is an advanced editor with multiple file support. EditExt (formerly EditorPro) is an advanced multi-tabbed text editor for programmers or plain text file editing, with full color syntax highlighting and code handling features for 9 different programming languages and multiple file types, HTML, Visual Basic and more. GWD Text Editor is a powerful shareware text editor for Windows. CREdit is a text editor for programmers. Kudaz is a programmer's editor with syntax-highlighting capabilities that currently supports 45 languages/scripts all told.